I havent gotton around to firing the Astra yet Ketch, it is long over due though. Will see if I get to it this year. I will tell you one thing that when it runs out of ammo it will bust open heads no problem. LMAO!! That seems to be a trait about quite a few of the Spanish pistols, heavy and built like tanks. Like the Firestars. Heavy for size but comforting. And how long have you had the Astra? Sounds like your lamenting having it for so long and not shooting it. Wow, I really like your the Astra 400 9mm Largo with holster and mag pic, its really nice, and I especially like your Star B 9mm I have always wanted a Star B second model with the curved backstrap. 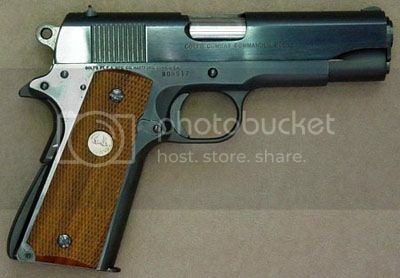 My favorite all time 9mm and i have never found one is a Colt 70 series Combat Commander in 9mm, for me one has been hard to find. Ketch, Looked it up, got it late in Nov 2008, didn't think it has been that long. Just never get to it due to many others to shoot. Papa its the Astra M600 9mm. You have had a cool gun like that for 8+ years and never shot it???!!!!! I would have gone crazy after a month having not shot a new toy, unless it was the type of collectable that should NOT be shot. Ok, then answer this, how does it feel in the hand? And by the way Gents, here is a great grip resource for Astra, Llama and Star grips. I have done business with him and he does great work and his prices are very reaonable. In fact the Gaboon Ebony grips on my Firestar .45 are by him. I strongly recommend him. Thanks for the link, nice grips and prides are nice too. Ketch it feels good in the hand but muzzle heavy. Curly I kinda thought it might feel that way from the grip angle and the design. Interesting design. Papa, his grips are very well done, I will attest to that as I have purchased 6 sets from him over time and liked them all. And your right about his prices, surprisingly low. You guys are a BAD influence. I had to get me a Star just because. It's a Star SS .380 with 4S Texas Mesquite grips. Now Ketch is putting on the pressure since he just scored a Llama on GB. Hey guys, recently got hold of some Peach wood that looked pretty nice so I decided to see how grips for my Star BM would look. And here they are. Unfortunately the wood was not quite dry enough yet and I am fighting some warping and a small crack but I like the way they look. Papabear if your out there, what do ya think?